← Can Process Knowledge Be Collected? One of the best examples of an ACM system, one that received a gold award in this year’s Excellence in ACM awards, was the system developed by Computas for the Norwegian Food Safety Authority. The focus of this post is on how they achieved true end-user agility in their process plans. The NFSA is a governmental body, whose aim it is to ensure the safety of food and drinking water, plant and animal health and animal welfare in Norway. It has about 1300 employees, most of which are knowledge workers like veterinarians, biologists, engineers and other professionals that use the system in their daily work. Food safety requires a learning organization. While large part of the job is routine processes: checking on a regular basis to see that guideline are in place, the most important part of the job comes when something unexpected happens. An outbreak of a disease is never expected. Furthermore, no two outbreaks progress in the same way. There is real danger to a lot of people when people start getting sick and nobody has a clear idea what is causing it. You can’t afford to sit back and wait until the causes are clear. Instead, people need to start acting the moment there is an indication of a problem, and the knowledge workers involved need full flexibility to do whatever it takes to resolve the problem quickly. Helle Frisak Sem, along with Steinar Carlson, gave a presentation about the NFSA system at the ACM Workshop in Tallinn. The system actually has two different approaches blended together. 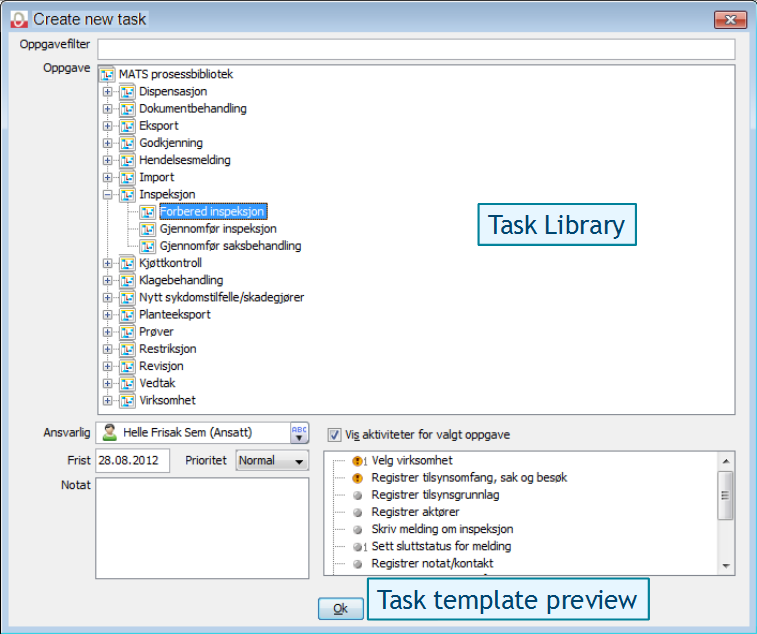 There is a more controlled task planning module for the more routine activities, and there is a emergency module which has no constraints. You might think of the system as having guardrails that protect and guide people from wandering off the task on the day-to-day activities. But, when an unexpected event occurs, the guardrails go away to allow for any possible action at any time. This dual approach is one of the more interesting aspects of the system. Food Safety Experts Create Their Plans? The plan looks more like a grocery list than a process model. There is a list of things that must be done. More important things, or things that must be done first, are placed near the top where they will get more attention. Note that even though this process is to cope with something as important and as critical as the outbreak of a disease, this does not look like a process diagram. This system demonstrates the ACM principle that a adaptive process should be represented as a simple list of things to get done. It is the absence of complex relationships between the tasks, that allows the knowledge worker to pick and choose without worry of causing a syntax error. There are no guardrails forcing the case manager to do specific things. The flexibility does not stop with the initial planning of the course of action. This planning continue as the case proceeds. As new evidence is found, goals may be added or removed from the list. Note the way that reviewing documentation and getting samples are intertwined. In real like some literature was reviewed, some samples taken, then back to the literature for more refinement, then back to the field for more samples. You can see that the real process unfolds as they do the work. Some steps were simply skipped because they are deemed unnecessary. Skipping a task is not the same as removing it from the process; when skipping a task it remains there as a note to others that it was skipped on purpose. In the main space you see a hierarchical tree of potential tasks, and in the lower right is the process plan as it is being composed. Once again, this tool is designed for the actual knowledge worker, the actual food safety expert, to compose the process that will be followed in order to complete the work. You might have specialists who help in preparation of the tasks in the library, but they have to be prepared in a way that a knowledge worker can take them and compose a process plan without programming and without fear of syntax errors. The ability for the knowledge workers to directly plan the process is not just a nice feature, it is a critical necessary function for a learning organization. 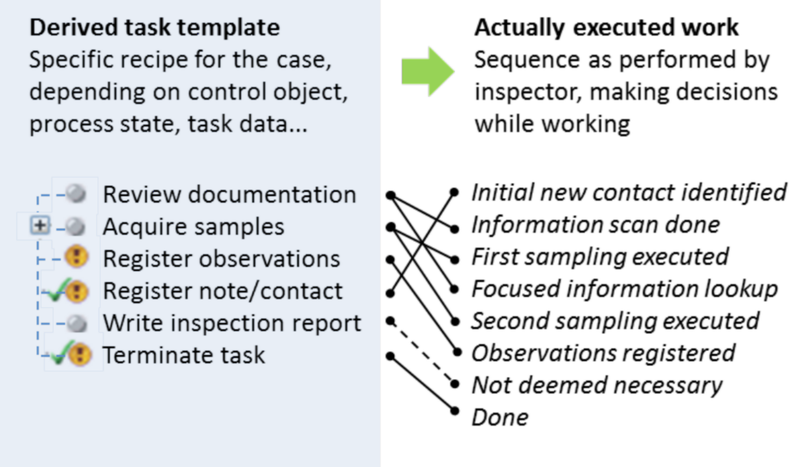 While the task template might not predict (or force) are particular set and ordering of tasks, the system does capture an accurate picture of what was actually done. That history of the case can be reviewed as possible template for future, similar cases. in the case of ACM, the cycle of process improvement does not come from forcing people to adhere to a prescribed process model, but instead by providing a system that makes it easy to communicate about your plan, no matter how the case manager structures it. 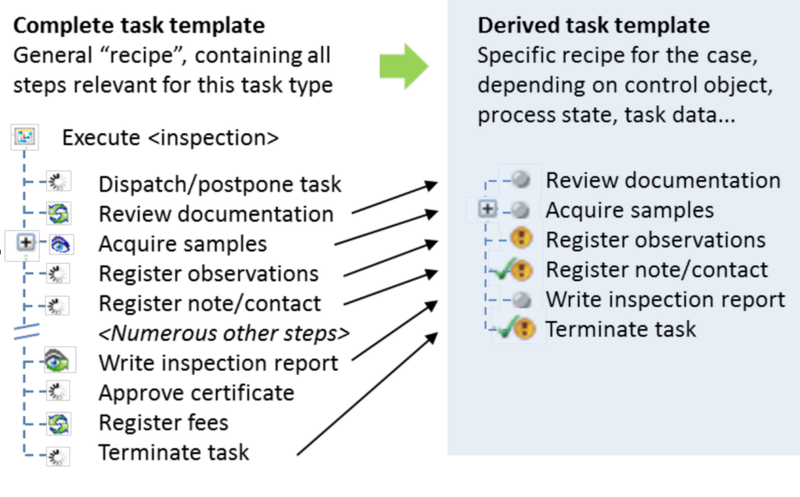 This use case is covered in detail in the upcoming book “How Knowledge Workers Get Things Done: Real World Adaptive Case Management” along with all the use cases that won awards at the 2012 ACM Excellence Awards. This entry was posted in Adaptive, Adaptive Case Management and tagged Adaptive Case Management, flexible, knowledge work, plans, process, process diagram. Bookmark the permalink.